We are proud to announce our 4th Annual Teen Advantage Scholarship. 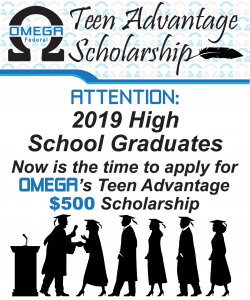 OMEGA wants to recognize its Teen Advantage members who have shown scholastic achievement and who are interested in advancing their education. We will award up to three individual $500 scholarships* to Teen Advantage members who will attend college full-time beginning Fall 2019. Application must be received by April 30th 2019. Here are the OMEGA Scholarship documents. Good Luck! Not a member of OMEGA FCU? To be eligible for this scholarship you must be a Teen Advantage member with us. Click here for a membership application to join today!